GRIFFINS AGAIN: Tonight marks the fourth of four meetings with the Griffins this season, and the final of Grand Rapids’ two scheduled visits to Tucson Arena. The Roadrunners are playing the final of a two-game home stand; the Griffins are playing the third of a five-game road trip. Both club are coming off of a meeting Friday night in which the Roadrunners won, 3-0. SPRING CLEANING: The Roadrunners assured home ice for the first round of the Calder Cup playoffs on Friday night. If the team is to win the Pacific Division by the result of one of the two aforementioned scenarios, they will automatically be granted home ice through the first two rounds. If the team is to clinch the Western Conference, they will guarantee home ice through the first three rounds. 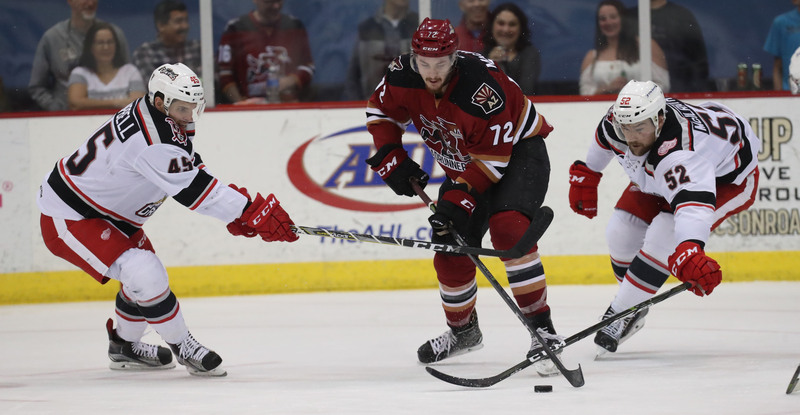 STAYING STINGY: In shutting out the Griffins, the Roadrunners held an opponent scoreless for the fifth time this season. Entering the night, Tucson has the fourth-lowest goals-against average (2.56) and the second-lowest shots-against average (26.77) in the AHL. PROJECTED LINEUP: The team held an optional morning skate at Tucson Arena ahead of tonight’s game. Per club policy, specifics regarding the team’s lineup will not be published until 5:00 PM this afternoon. LAWSON ON A ROLL: Lawson Crouse matched a season-long point streak, extending his run of hitting the score sheet to four-straight games with his goal on Friday night – his third of the game-winning variety this year. 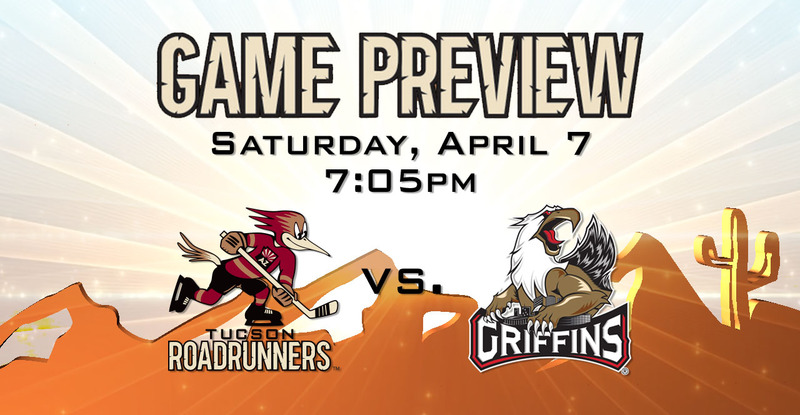 THE LAST TIME AROUND: In the teams’ previous meeting on Friday night at Tucson Arena, the Roadrunners topped the Griffins by a 3-0 count. Lawson Crouse opened the scoring just past the game’s midway point, netting what would ultimately prove to be the game-winner. Ryan MacInnis upped Tucson’s lead early in the third; Tye McGinn iced the affair with an empty-net goal with under a minute left to play. Adin Hill turned away all 26 shots he faced to record his fourth shutout of the season. NUMBERS GAME: Tye McGinn’s empty-net tally was the Roadrunners’ 200th goal of the season. One more win will give the team 40 on the season. With his assist on Lawson Crouse’s marker last night, Carter Camper now has 60 points on the year, ranking him in at eighth-overall in the AHL in scoring. WE’RE DOING IT LIVE: You can catch tonight’s action on AHL Live. Roadrunners play-by-play broadcaster Tom Callahan, along with color commentator Tim Gassen, will have the radio call on AM 1450 Fox Sports Tucson. Radio coverage begins at 6:50 PM.